“I had a phenomenal trip to Russia thanks to my tour guides! This tour is a must do." A perfect match for active travelers seeking to explore all Russia. Apart from visiting the main landmarks of the mighty capital - Moscow, you get to see multi-sided and diverse Russia far and wide while travelling along the whole Trans-Siberian railway line. Visit Nizhny Novgorod Kremlin, Kungur Ice Caves in Perm, cross Europe-Asia border, visit the capital of legendary Siberia and witness the beauty of Lake Baikal. Discover genuine Russian towns and reach the Far Eastern port of Vladivostok which is literally closer to the US borders than to Moscow! Note: Tour departures available from mid-May to mid-October. A reverse program is also available. Please contact us for details. Welcome to the gorgeous capital of Russia -​ Moscow! Your driver meets you at the airport and transfers you to your centrally located hotel for check-in. After break for lunch you have a wonderful city tour around the most magnificent Moscow landmarks. During the tour you take a walk at the beautiful Red Square, go inside the colorful St. Basil's Cathedral, see the spectacular Cathedral of Christ the Savior and enjoy one of the best city views at Sparrow Hills. In the morning you check out from the hotel and your driver transfers you to the railway station where you board a high-speed train that takes you to Nizhny Novgorod in just 4 hours. Upon arrival you meet your guide at the train station and go on a wonderful panoramic city tour around the most famous attractions of Nizhny Novgorod. During the tour you stroll through a pedestrian Bolshaya Pokrovskaya street, see the beautiful Stroganovskaya Church, explore the ancient Annunciation Cathedral, enjoy fantastic city views from the Volga slope and visit the famous Nizhny Novgorod Kremlin. 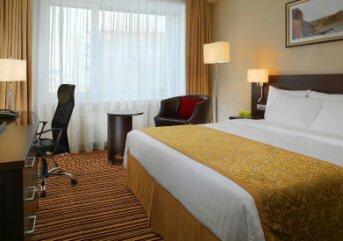 After the tour you are transferred to your centrally located hotel for overnight. The rest of the day is free. Upon arrival your driver meets you at the train station and transfers you to your centrally located hotel for check-in. The rest of the day is free for you to relax in your cozy room or start exploring the city center on your own. Breakfast and one meal on board are included. Upon arrival in the evening your driver meets you at the railway station and transfers you to your centrally located hotel for check-in. The rest of the day is at your leisure. After the tour you are transferred to Novosibirsk railway station to continue your journey. After breakfast you check out from your hotel and say "Good-bye" to Lake Baikal! Your driver takes you to Irkutsk for a guided tour around the most remarkable city's attractions. You are then driven to one of the main monasteries in Siberia - Sigh Monastery also known as the Znamensky Monastery. You also explore the Kazan Church, which with its Byzantine style decorations looks like a fairy tower, and Block 130, the historical zone with many colorful wooden houses and buildings constructed in the 17th century. After the tour you are transferred to centrally located hotel, and the rest of the day is free for you to explore the city on your own. In the afternoon you arrive in Ulan Ude - the capital city of the Republic of Buryatia. Upon arrival your guide meets you at the railway station and takes you to your centrally located hotel for check-in.